Combine and sift flour, baking soda, and salt. In a separate bowl, cream butter or margarine. Add sugar, egg, and vanilla; mix until smooth and creamy. Stir in dry ingredients; blend in toffee bits and pecans. Drop tablespoonfuls 2 inches apart onto greased baking sheets. Bake at 350 degrees F (175 degrees C) until done, 12 to 15 minutes. Remove from baking sheets and cool. 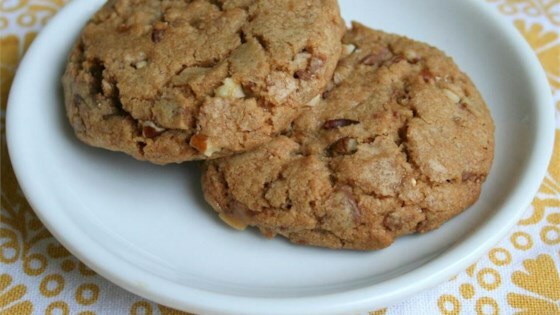 These easy cookies make a great snack or holiday gift. i love these!!!!! they only lasted a day!! i did the same and did half choc. chips. My family was fighting over the last two! I will definitely make these again. I used crushed toffee candy instead of the bits. They turned out pretty good but next time I make them, I'll use the toffee bits and see if that makes a difference in how they taste.